Built in sleek style and long-lasting utility, this chrome-finished shower faucet from JALO is a must-have for your bathroom. Easy to install, it's a great way to add style to any shower or tub. Shower head and hand shower max. flow rate : 2.5 gpm (80 psi). Bathtub spout flow rate : 6.6 gpm (60 psi). Stylish and strong, this chrome-finished tub shower faucet from Delta makes a great choice for any bathroom. The faucet comes with 3 spray settings that you can easily adjust to suit your needs. Turn the stylish lever handle for quick and easy control. From the experts at Delta, this modern chrome-finished tub shower faucet brings a touch of style to any bathroom. Control water flow and temperature with a turn of the lever handle. Spruce up the look of your bathroom with style and top-notch utility with this chrome-finished tub shower faucet from Delta. You can adjust its 5 spray settings for a perfect shower experience every time. Change the water temperature to how you like with the faucet's lever handle. If you're searching for a cool, crisp look then Essence is the collection for you. Its glistening chrome finish, due to GROHE StarLight finish for scratch and tarnish-resistant surfaces for a lifetime of beauty technology, enhances its clean, minimalist shape and pure design, while GROHE SilkMove for a lifetime of smooth operation gives you a faucet that is technically advanced. Essence is a stylish Dual Function Pressure Balance Trim with Control Module that will endure long after passing trends fall by the wayside. Thermostatic Rain Shower Faucet in Chrome Built in sleek style and long-lasting utility, this chrome-finished shower faucet from JALO is a must-have for your bathroom. Easy to install, it's a great way to add style to any shower or tub. Thermostatic Rain Shower Faucet in Chrome is rated 4.7 out of 5 by 9. Rated 5 out of 5 by Paul from Minimalist Styling is minimalist. Modern and clean. Functionality is all we could ask for. Works great with our bathroom renovation. Every part you need, and no part you don't want. Rated 5 out of 5 by The Vanguard from Best shower - ever! I was remodeling the bathroom in our home and wanted a good shower unit at a reasonable price. Purchased the Jalo shower kit on-line from Home Depot. Delivery was on time and without damage. As the install began, we noticed the spout was missing from the kit. I contacted the Canadian source, Baril Design in Trois-Rivières, Québec and they shipped the piece immediately. Great service. Imagine if I had to deal with an American or other foreign distributor. In 48 years of home ownership, we have never had a shower unit that has performed this well. The rain shower head provides an amazing experience to the point that I told my wife I don't want to get out of the shower in the morning. Thank you Baril Design. The Jalo shower unit makes a great addition to our remodeled bathroom. Rated 4 out of 5 by Budgy10 from Good Quality, Great Price! I had priced out buying a diverter valve, temperature control valve, and all the shower heads separately and it came up to a very large sum. I randomly came across this set and am so glad I did. This has all the functionality I require, is decent quality and a great price. I am very happy with it. I would recommend to anyone who would like a decent set on a lower budget. The only downside is that the instructions could be a bit better. Rated 3 out of 5 by Rod B from Don't buy online This item (and brand) is not carried in the stores. There was an issue with the manifold and cartridge and no parts are available in the stores. I was told to phone the company directly and possibly wait 2-3 weeks for a part. Our customer's bathroom was torn apart and we were ready to close the wall in and tile the shower. LOTS of extra hassle. Fortunately I was able to rebuild the unit from non-factory parts and get it working. Over $1,000.00 in wasted time. Once installed the unit looked fine. Rated 5 out of 5 by Jenn from It looks great Once you get used to how the dials work, this is a very good investment. It took me a while to get the hang of it and am I ever glad I stuck with it. Rated 5 out of 5 by lynnmariexo from Great Product at a Great Price! I recently purchased this kit for my main bathroom renovation in the condo I live in. Installation seemed easy although I did have a professional contractor and plumber do the work. All the parts (except for some piping components which I was told were never included in such kits) were present and accounted for. 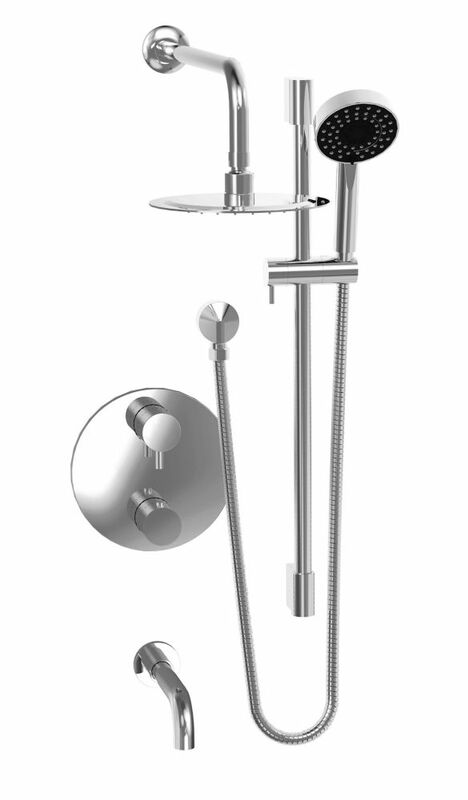 The kit includes everything you need, as shown in the diagram, and the rainhead shower, the handheld shower, the tub spout and the diverters are sleek and modern, and in my opinion look great. They also feel like good sturdy, quality products. Most importantly, they truly perform and I really enjoy taking a shower with my new system. I will mention that I have great water pressure in my condo so I'm not sure if this adds to the fact that I see such a difference compared to my old system. Even though the tub spout looks similar to a larger style sink faucet, my tub fills up amazingly fast. I attempted to put a system together using separate components but found it too difficult as I was not confident I was getting everything I needed. I feel this kit was a great value for all of the features it includes. Can you tell me if the rain head pivots at all once installed? It has minimal movement. However with the shower wand it makes up for it. We had this set installed in a reno however the manual got thrown out. Can anyone tell me what the bottom knob is for and how to use it in relation to the top knob that turns on the tub/hand held/shower? go to jalo.ca and search for it. they seem to have a wealth of resources on product catalogs, specs and manuals. So I know it says part of the component is a 3-way diverter, is that the actual valve or just the diverter trim/handles?